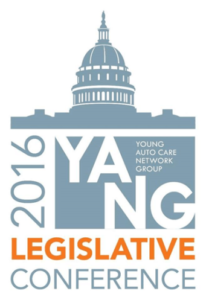 Mark Murphy, ASE master technician, Dynamic Automotive in Urbana, Md., participated in the 2016 YANG Legislative Conference, June 13-14 on Capitol Hill. 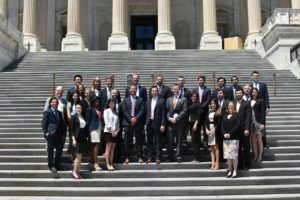 Attendees traveled from all parts of the country to meet face-to-face with their members of Congress to express their views on issues facing the auto care industry, including the possible impact of telematics on today’s modern vehicles and the Digital Millennium Copyright Act (DMCA). their vehicle is serviced. Not allowing the owner of the vehicle the ability to determine who receives their vehicle data can give the manufacturers an unfair advantage in the market. Manufacturers have used the Digital Copyright Act to limit and even deny service facilities the vehicle data, arguing it was to protect the copyright of the software. It is believed their intention was not only to protect the copyright, but to thaw competition from these service centers. With the advancement of today’s vehicles that use software to operate every facet of the vehicle, the old copyright law is obsolete and in need of updating, so that manufacturers cannot hide behind it. On the first day of the 2016 YANG Legislative Conference, participants assembled at the Auto Care Associations headquarters for introductions, followed by a presentation by Chris Blalock, Dorman Products. Blalock was able to get everyone up to speed on telematics and its effects on the future of their industry. Next, Sheree Anne Kelly from the Public Affairs Council explained what to expect when meeting with politicians and their staff. Her advice was to keep ideas clear to better get the message across. After a quick educational presentation, the group was broken up to role play with Auto Care Association staff to prepare for the next day’s meetings. Day two was a fast-paced day that got started early. Twenty-six YANG members attended a total of 45 meetings with members of Congress that represented 14 states. Congressmen Scott Perry from Pennsylvania 4th district was the first visit. He expressed how important it was to bring up issues like telematics and vehicle data ownership to their representatives so they understand who the stakeholders are. Representative Perry was very knowledgeable about the issues because he has previously been a part of the Auto Care Caucus. Everyone felt that this year’s event was a success at bringing awareness to our politicians about our concerns for the industry. This was the first year YANG joined the staff from the Auto Care Association and this combination seems to have been a smashing success.